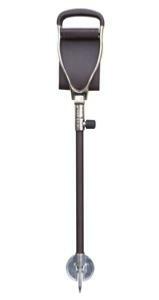 A classically styled stainless steel seat stick with a dark brown leather extra-wide seat and tan leather covered leg. It makes a perfect accessory for use in the country and an excellent, practical gift. The seat stick is adjustable in height to suit a wide range of users. Walking height adjusts from 78 to 104cm; sitting height adjusts from 60 to 86cm. The seat when opened is 11cm deep by 34cm wide (or 44cm wide including the handles). The leather is cowhide with an applied pigskin style grain. The seat stick has a pointed stainless steel ferrule with folding ground plate for use on soft ground. A rubber ferrule with the appropriate square aperture is available separately (ref 3716) and can be fitted over the metal ferrule for use on hard ground if required. Item weight 1.2kg.